Looking for information on a prominent Texas figure or ancestor? The Bio Gaz might be the resource for you! But you don’t have to come to our reading room (although you’re welcome)–you can search online! 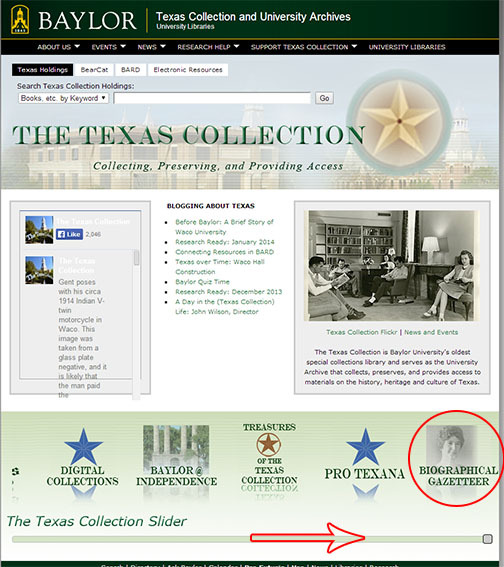 “Do you have any information on my grandfather?” Texas Collection (TC) staff is regularly greeted with patrons seeking information on people. Typically we point patrons in the usual direction of census, birth, death, and marriage records. These records can provide the who, what, when, and where. But where do patrons look when they want to find the why or how? There is a resource unique to our collection that may help patrons answer those questions. The Texas Collection is home to numerous volumes containing biographical sketches of notable Texans and early pioneers. Many of these books do not contain an index, and when a patron needs information on a person, it can be overwhelming for staff and the patron to search through nearly 200 volumes of biographical sketches to find someone. So, in the early 1980s, TC staff created a Biographical Sketch File. After identifying the volumes to be included in the file, staff created a catalogue card for each person listed in the biographical sketches. Each card included a name, birth and/or death date (if available), the book title, page number where the sketch can be found, and whether a portrait is included. 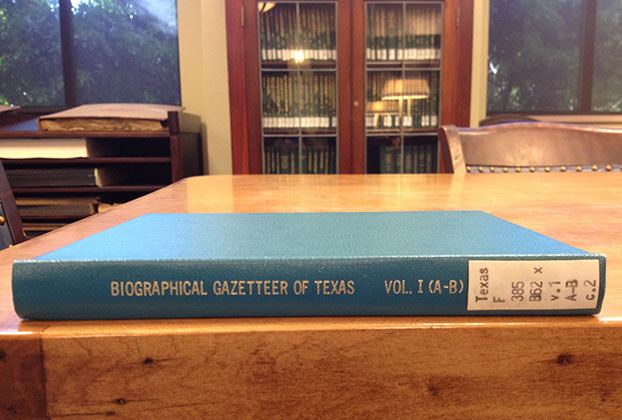 This Biographical Sketch File became a popular finding aid, so in 1985, The Texas Collection published it as the Biographical Gazetteer of Texas. (You might hear our staff call it the “Bio Gaz.”) This six-volume set includes over 67,000 entries. 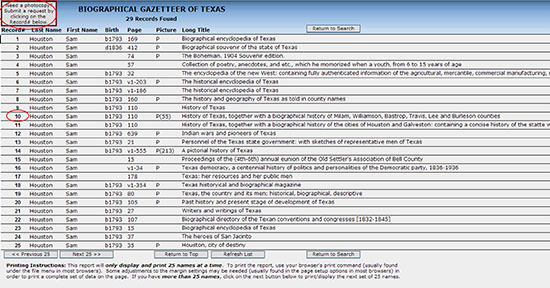 After using the Biographical Gazetteer of Texas in book form for over 20 years, staff and student employees entered the information into a searchable database in 2007. You can access it on our website—follow the instructions below to get started! 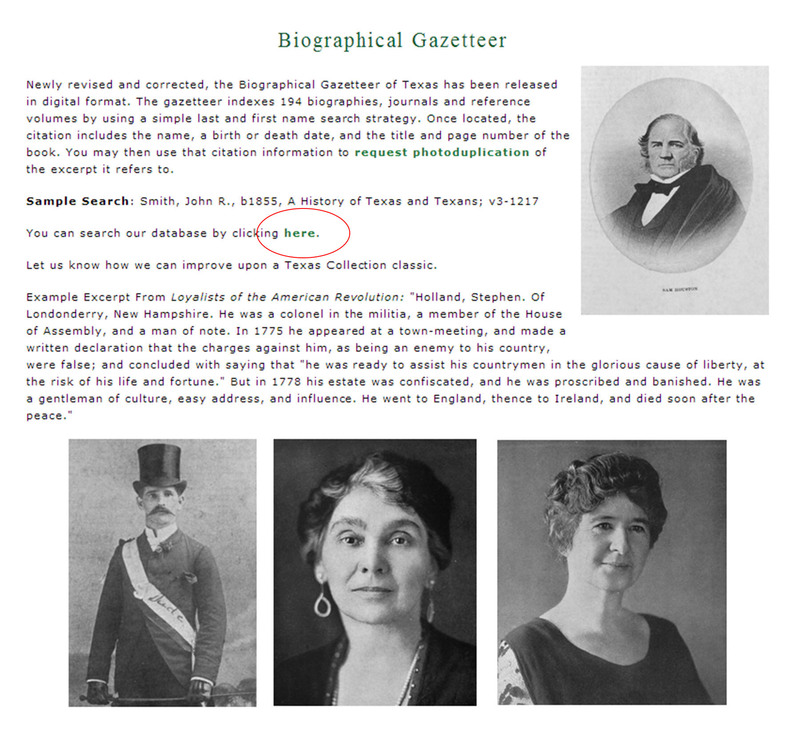 Step 1: Click the “Biographical Gazetteer” link on our website (move the bottom slider until you see it in the list). Step 2: Click on the “here” to search the database. Step 3: Type a person’s name and click the “Click Here to Find” button. (Do not hit enter after typing a name because the search will not work.) Be aware that many people use initials, so first names aren’t often necessary and may even return incorrect results. There also are many variant name spellings, so patrons should try several options. Step 4: Results! This list informs the patron about where information may be found. If patrons see an entry that fits their search criteria, they may either come in to view the item or may request a photocopy of the material. To request a photocopy, click on the record number. Step 5: On the next screen, enter contact information and submit the request. Staff will then contact the researcher with photoduplication fees. 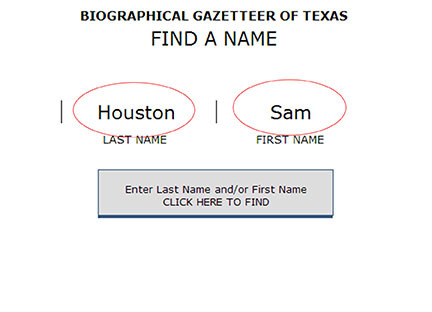 Texas Collection staff often uses the Biographical Gazetteer of Texas and we hope that it is a resource that helps our patrons as much as it helps us. Happy hunting! “Print Peeks” is a regular feature highlighting select items from our print collection.